Rain was no deterrent for protestors in Hialeah Gardens against State Rep. Manny Diaz Jr., chair of the House education committee. Standing in rain across the street from Hialeah Gardens city hall, representatives of the United Teachers of Dade denounced House Bill 7055, which requires that half of all teachers eligible to be members of a teachers' union must be dues-paying members or else the union will be decertified. The protestors were frustrated with lawmakers like Rep. Manny Diaz Jr., a Hialeah Republican who chairs the House education budget committee and supported the bill. 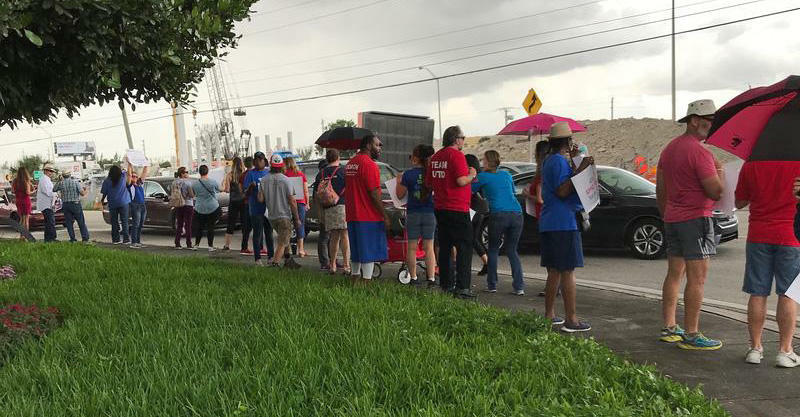 "The same legislators that we are talking about have done things intentionally so that they can silence the teacher's voice," said Karla Hernandez-Mats, president of the United Teachers of Dade. "We're the ones advocating for students. We're the ones saying, 'These policies aren't right.'" As the protestors waved signs at passing cars, Hernandez-Mats and Jeffrey Mitchell—the president of the South Florida AFL-CIO—said the rally was meant to spread awareness about the new law and organize opposition against Diaz Jr., who is running for a state Senate seat in the upcoming November elections. In a statement in response to the protest, Diaz Jr. said the law "gives all teachers a voice on who represents them in collective bargaining." He also cited a state program that awards teachers bonuses if they are rated "highly effective" or "effective." House Bill 7055 has been a source of much controversy. Under the law, unions must maintain 50 percent membership among teachers eligible to join them. 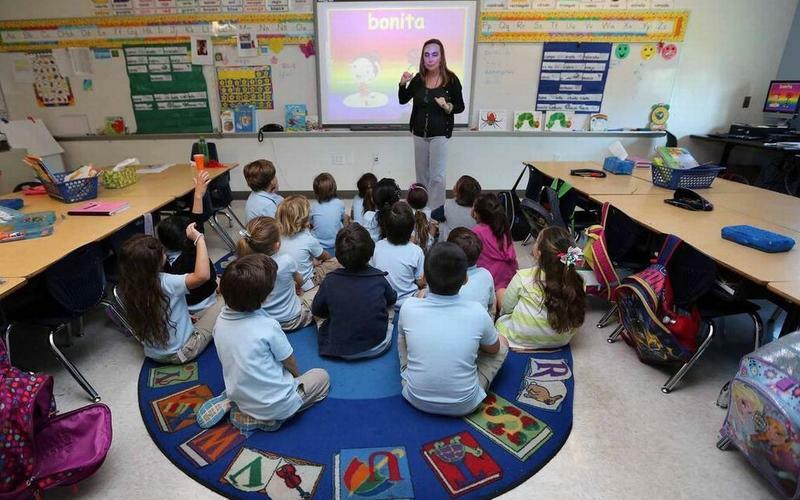 South Florida teachers' union presidents have argued that the law is unconstitutional and discriminatory because it targets only public school employees and not other public-sector workers. Hernandez-Mats said recent teachers strikes across the country including in Oklahoma and West Virginia have galvanized support in Miami-Dade for more public education funding. Still, striking has not been an option for union presidents in a state that ranks fifth worst for teachers, according to a 2017 study by the personal finance website, WalletHub. Under state law, striking teachers can be fired and their unions can lose their certifications and be slapped with fines. Hernandez-Mats stressed the importance of voting out lawmakers who support measures like House Bill 7055. "We're going to make sure the community is aware that we cannot vote people like [Diaz] back into office and of course make sure that the public knows it must support public school teachers," Hernandez-Mats said.